The end of the school year is quickly approaching so we have started to think about Teacher Appreciation gifts. I always like to give needed supplies to teachers like our sticky pop gift, but I also love to give a small gift that my kids can participate in and help me create. My children’s school dedicates an entire week to teacher appreciation and this year they went with a superhero theme. 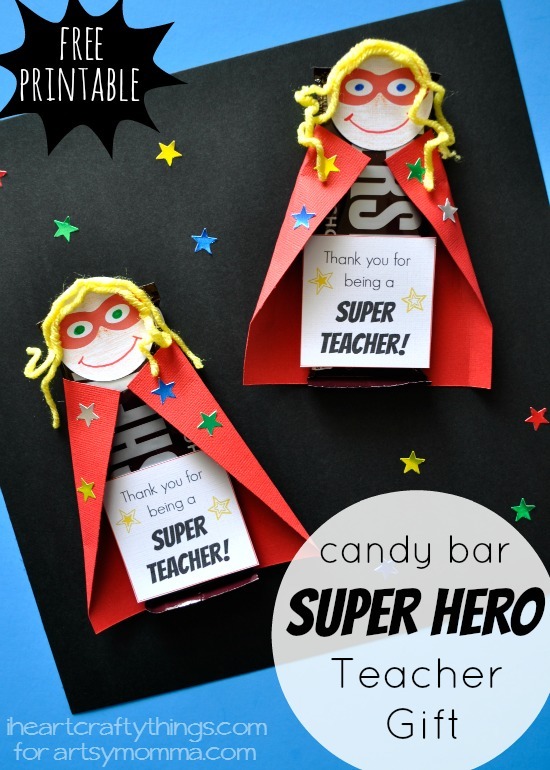 I created this fun superhero candy bar DIY Teacher Appreciation Gift that kids can help take a part in creating for their teachers. I’ve included a free printable of the superhero face and gift tag to make the project even more simple for you. 1. Start by cutting out a 5-inch by 5-inch square out of your red cardstock paper and gather the rest of your supplies. 2. 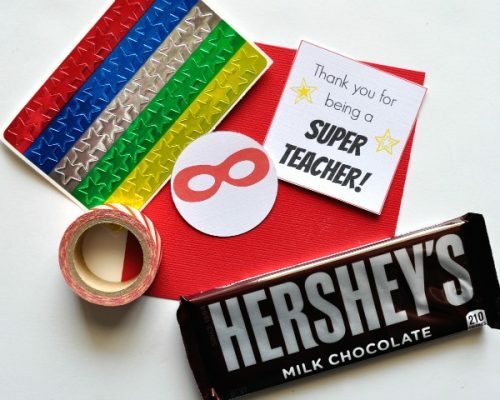 Wrap your red cardstock square around your candy bar to make a cape and make a crease down the sides to help show you where to add your tape. Remove the candy bar. 3. Roll a few pieces of tape to make both sides sticky and place a small piece at each of the top corners and in the middle at the top. 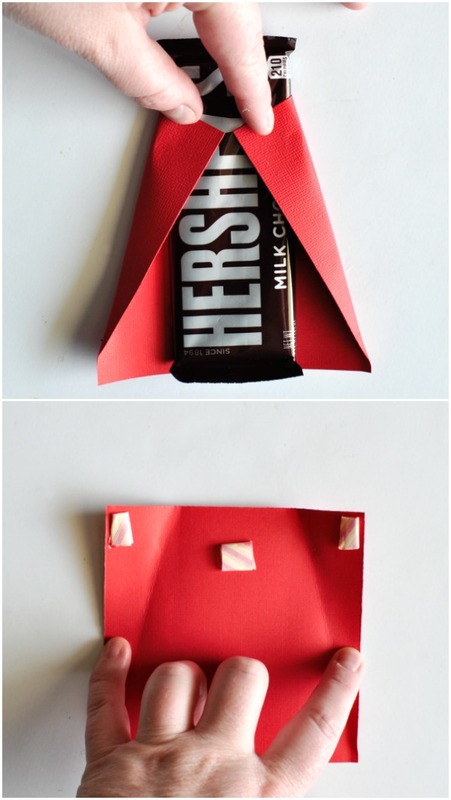 Now place your candy bar back inside the cardstock paper and press the tape down to hold the candy bar in place. If you have glue dots those would be a great option for holding the cape in place too. 4. Now get busy decorating your superhero face. We used markers to draw eyes inside the mask and a mouth and then colored the skin with crayons. To give more dimension, we also decided to glue yarn on for hair. This step is optional and you can easily just draw on hair with your markers or crayons. We also only had yellow yarn on hand but it would be fun to use brown, black, red or gray to match your child’s teachers hair. I recommend using tacky glue to glue the hair down instead of school glue to give it more of a hold. 5. Once you are finished decorating the face, add a piece of tape to the back of it and attach it to your candy bar. Add a piece of tape to the back of the teacher tag and add it to the bottom of the candy bar. 6. 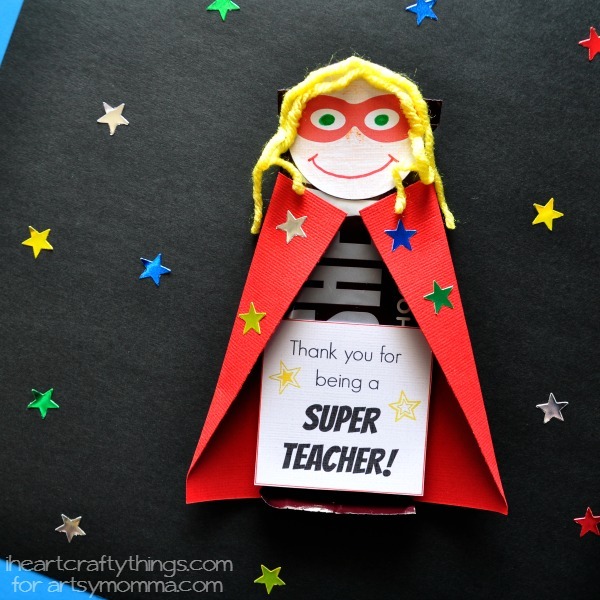 Finish your superhero teacher appreciation gift by adding star stickers all over the front and back of the cape. 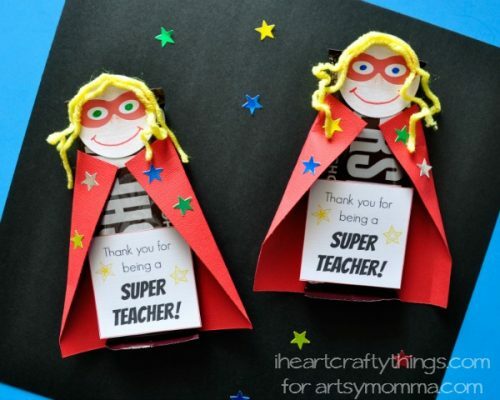 Your child’s teacher is sure to smile and feel like a hero when your child hands them this simple and fun teacher appreciation gift. 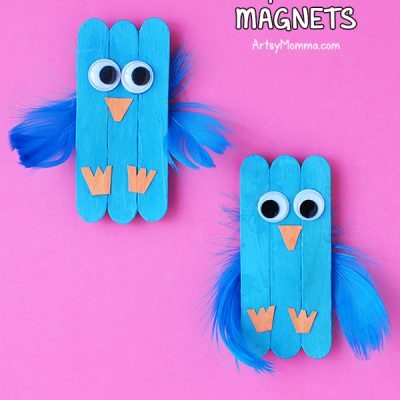 You might also be starting think of fun crafts to make with your kids over the summer break. 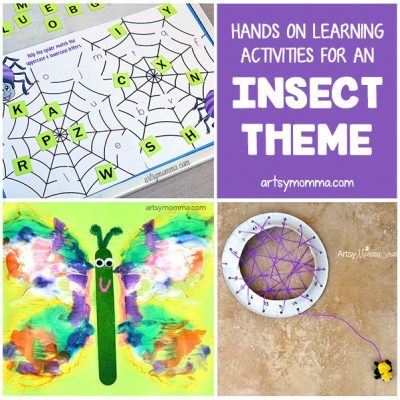 Feel free to check out I Heart Crafty Things’ Summer crafts category for fun ideas like our beaded dragonfly and lightning bugs or these 15 fantastic ocean themed crafts! Thanks for this and for the printable. Made a hectic end of the year easy with a perfect gift idea for my kids’ teachers. (Superhero theme for the school year!) AND it is the perfect way to spend a rainy, windy day. Appreciate your creativity. Thanks for this awesome idea! In India, we celebrate teacher’s day as a dedicated day to teachers and this made the perfect gift at my son’s Montessori school. Super cute! I’m actually going to turn the idea around and have my students make this for their mother’s day for Mother’s Day! Thank you! Not able to download the printable for super hero card..where’s this link? 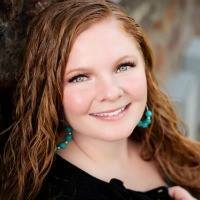 I love how cute these turned out! I’m actually planning on using them for nurses week. Is there anyway to get a download of just multiple faces on one page? I have a different nurse slogan to use.